Combe Martin is a small town on the North Devon coast, with a nice sandy beach flanked by rock pools. There is easy access to the beach and facilities are close to the beach. To the east of the beach is a small sandy beach called Newberry Beach. At Combe Martin there is level access to the beach and there is also a sloping path from the main car park to the beach. There are steps down at Newberry Beach. Dogs banned on Combe Martin beach between 1st May and 30th September. 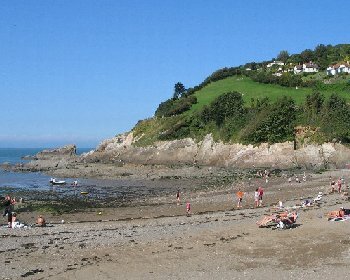 Combe Martin is close to Ilfracombe which is 45 miles from Bude and 52 miles from Exeter. There are various routes into North Devon. From North Cornwall take the A39 (North Atlantic Highway) past Bude and into North Devon towards Barnstaple. Alternatively from Exeter take the A377 to Barnstaple. At Barnstaple follow the A361 over the new road bridge over the River Taw and then at the Braunton Road Junction turn right (signposted to Lynton). Follow this road into Barnstaple, cross the bridge over the River Yeo, then follow signs to Lynton and Combe Martin onto the A39. Follow the A39 out of Barnstaple and then continue on the A39 for about 10 miles until the Ford Cross junction and here turn onto the B3229 (signposted to Combe Martin). Follow the B3229 until the Easter Close Cross junction and here turn left onto the A399 for Combe Martin. Follow this road to Combe Martin. 1 large car park above Combe Martin beach, also a small car park to the north of the beach. Also 1 small car park by Newberry Beach. Yes, by the main beach car park in Combe Martin.